Glyptemys muhlenbergii, the bog turtle, is a member of the largest and most diverse group of turtles, Emydidae. Until recently, G. muhlenbergii was included in the genus Clemmys, along with Clemmys insculpta (the wood turtle, now Glyptemys insculpta) and Clemmys guttata (the spotted turtle). It was found, however, that the wood turtle and bog turtle remained each other’s closest relatives. However, neither taxon was closely related to the spotted turtle, and overall, the genus Clemmys was paraphyletic when these two turtles were included (Bickham, et al., 1996; Burke et al., 1996; Gaffney and Meylan, 1988). Subsequently, these taxa were removed from Clemmys and placed in their own genus, Glyptemys, as recommended by Holman and Fritz (2001). Glyptemys muhlenbergii exhibits a small, testudinid-like skull, with a widely emarginated temporal region and lack of a squamosal-parietal contact characteristic of most emydids (Ernst and Barbour, 1989). Additionally, emydids tend to have well-developed dorsal rib heads, an unjoined maxilla and quadratojugal, a reduction of the femoral trochanteric fossa, and an absence of mesoplastral, intergular, and inframarginal scutes (Ernst and Barbour, 1989). 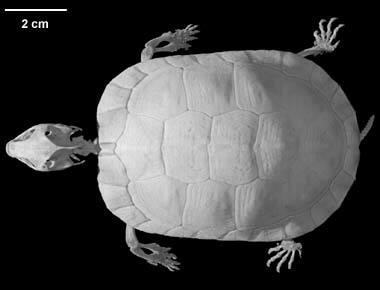 Characters that are diagnostic for the bog turtle include a weakly keeled carapace, a medially notched maxilla, and vertebral scutes that are longer rather than wider (5th is longest) (Ernst and Barbour, 1989). Another major threat to G. muhlenbergii is the illegal capture for private and commercial purposes. Bog turtles are actually the smallest species of turtle in North America, with an adult size hardly ever exceeding 11.5 cm (4.5 in) (Ernst and Barbour 1989), and this no doubt, only adds to their appeal. This species is also known for its mild-mannered behavior, choosing to burrow when alarmed rather than bite or scratch, making it a popular target of the pet trade. This specimen (UF 85274) has no locality data. 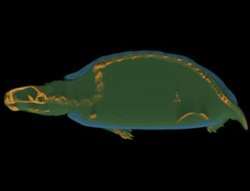 It was made available to the University of Texas High-Resolution X-ray CT Facility for scanning by Dr. Timothy Rowe of the Department of Geological Sciences, The University of Texas at Austin. Funding for scanning and image processing was provided by a National Science Foundation Digital Libraries Initiative grant to Dr. Rowe. 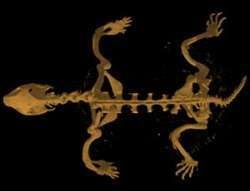 The whole specimen was scanned by Matthew Colbert on 30 October 2003. It was scanned along the coronal axis for a total of 1215 slices, each slice 0.10 mm thick with an interslice spacing of 0.10 mm and a field of reconstruction of 90 mm. Bickham, J. W., and J. L. Carr. 1983. Taxonomy and phylogeny of the higher categories of cryptodiran turtles based on a cladistic analysis of chromosomal data. Copeia 1983:918-932. Bickham, J., T. Lamb, P. Minx, J. Patton. 1996. Molecular systematics of the genus *Clemmys* and the intergeneric relationships of emydid turtles. Herpetologica 52: 89-97. Brenner, D., G. Lewbart, M. Stebbins, and D. W. Herman. 2002. Health survey of wild and captive bog turtles (Clemmys muhlenbergii) in North Carolina and Virginia. Journal of Zoo and Wildlife Medicine 33:311-316. Burke, R., T. Leuteritz, A. Wolf. 1996. Phylogenetic relationships of emydine turtles. Herpetologica 52: 572-584. Chase, J., K. Dixon, J. Gates, D. Jacobs, and G. Taylor. 1989. Habitat characteristics, population size, and home range of the Bog Turtle (Clemmys muhlenbergii) in Maryland. Journal of Herpetology 23:356-362. Fahey, K.M. 1999. Geographic Distribution. Clemmys muhlenbergii. Herpetological Review 30:108. Ernst, C. H., and W. Barbour. 1989. Turtles of the World. Smithsonian Institution Press, Washington, D. C., 311 pp. Holman and Fritz. 2001. Zoologische Abhandlungen Staatliches Museum für Tierkunde Dresden 51:331-353. Morrow, J.L., J.H. Howard, S.A. Smith, and D.K. Poppel. 2001. Habitat Selection and Habitat Use by the Bog Turtle (Clemmys muhlenbergii) in Maryland. Journal of Herpetology 35:545-552. Shaffer, H. B., P. Meylan, and M. L. McKnight. 1997. Tests of turtle phylogeny: molecular, morphological, and paleontological approaches. Systematic Biology 46:235-268. Stephens, P. R., and J. J. Wiens. 2003. Ecological diversification and phylogeny of emydid turtles. Biologidal Journal of the Linnean Society 79:577-610. This animation shows the shell and soft tissue fade as the skeleton spins (2 mb). This animation is a sagittal cutaway with the soft tissue, shell and skeleton (minus shell) rendered in three separate colors (2.5 mb). To cite this page: Dr. Jennifer Olori, 2004, "Glyptemys muhlenbergii" (On-line), Digital Morphology. Accessed April 19, 2019 at http://digimorph.org/specimens/Glyptemys_muhlenbergii/whole/.